DALLAS — In the history of great pairings, TruMoo introduces its newest seasonal flavor – Chocolate Marshmallow. Starting today and throughout February, chocoholics and marshmallow fanatics across the country can come together and enjoy a rich, velvety-smooth nutritious and delicious treat without breaking any New Year’s resolutions. TruMoo Chocolate Marshmallow milk is the perfect treat for the taste buds for every occasion. Enjoy it cold or “Try It Hot” for an instant hot chocolate drink with your favorite toppings, like mini marshmallows, whipped cream or a graham cracker rimmed glass. Whether it’s served hot or cold, moms can be assured that TruMoo Chocolate Marshmallow Milk has the same nutritional benefits as original TruMoo including no high fructose corn syrup and no artificial growth hormones. TruMoo, the nation’s leading ready-to-serve flavored milks, is made with milk sourced from local dairies. Similar to regular milk, TruMoo provides eight essential nutrients: calcium, protein, vitamins A, D and B12, riboflavin, phosphorus and potassium. And, the most popular lowfat (1%) TruMoo only contains 140 calories per serving. That is only 30 more calories than lowfat white milk. 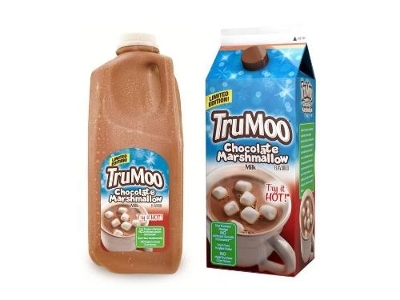 TruMoo Chocolate Marshmallow milk can be found in the dairy section at Target and other major retailers nationwide now and throughout the month of February. Regular TruMoo chocolate, vanilla and strawberry milk varieties are available year round in gallon, half gallon, quart and single serve (10-, 12-, 14- and 16-ounce) bottles. To find TruMoo Limited Edition Chocolate Marshmallow at a retailer near you and for more information about TruMoo, visitwww.TruMoo.com, www.Facebook.com/TruMooMilk and www.Twitter.com/TruMooMilk. Dean Foods® is a leading food and beverage company in the United States and is the nation’s largest processor and direct-to-store distributor of fluid milk. Headquartered in Dallas, Texas, the Dean Foods portfolio includes TruMoo®, the leading national flavored milk brand, along with well-known regional dairy brands such as Alta Dena®, Berkeley Farms®, Country Fresh®, Dean’s®, Garelick Farms®, LAND O LAKES® milk and cultured products*, Lehigh Valley Dairy Farms®, Mayfield®, McArthur®, Meadow Gold®, Oak Farms®, Pet®**, T.G. Lee®, Tuscan® and more. In all, Dean Foods has more than 50 local and regional dairy brands and private labels. Dean Foods also makes and distributes ice cream, cultured products, juices, teas, and bottled water. Nearly 19,000 employees across the country work every day to make Dean Foods the most admired and trusted provider of wholesome, great-tasting dairy products at every occasion. For more information about Dean Foods and its brands, visit www.deanfoods.com. **PET is a trademark of The J.M. Smucker Company and is used by license.